Barnes and Noble provides Windows PC-based ebook reader software that works very well with ePub formatted books. There is motive in their madness, as the B-and-N Nook reader uses the ePub format natively. I’ve found their Windows nook emulation software to be quite excellent. I think the software is still a free download. The Barnes and Noble approach to helping book writers create ePub ebooks is to provide a web front-end for the purpose. When a manuscript is uploaded, B-and-N does the processing on the back-end. This requires an account, which comes with (I believe) an expectation that creative works will be listed on the online store. It is possible to use free software from Barnes and Noble to write Nook add-on applications and to do it with the use of free/open source systems such as FreeBSD or Linux. The software provided by B-and-N is in the form of special eclipse plugins (purposed to creating Android apps), so the underlying java machine creates the “cross platform-ness” that is required. However; Nook applications are a topic for another thread on some other day. Like Barnes and Noble, Amazon provides ebook creation facilities via their own website(s). Use of this feature on Amazon is part of the Kindle developer’s program and requires an account. The expectation is that writers will host their creative works on the site. Various Apple products are usable for reading ebooks, but this author’s experience with them is slight. In the open source world, many use the Calibre software program to create ebooks. My experiences with Calibre were mixed. It has been quite a long while since I last looked at the software suite. I must say it never really complemented my sense of simplicity. Simple PDF files are still used extensively for ebooks. These files have a serious advantage over any of the handheld reader formats when intricate and graphic intensive book content is contemplated. Unfortunately, handheld readers (in my opinion) do a poor job of rendering PDF content). An author should try to determine the demographic of his audience. Will they use handhelds, or will they use a PC computer? 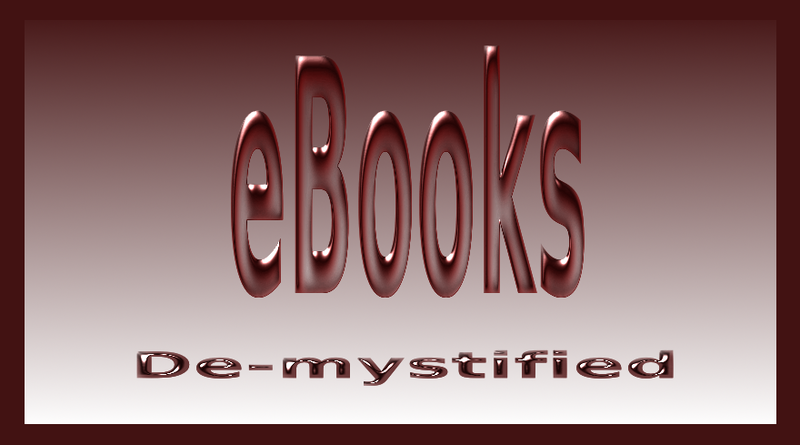 If they will use handhelds, then produce the books in the native format for the particular reader (ePub, mobi, etc). If a PC computer will be the main means by which the audience will view created works, then use a PDF.